Summary: Some good achievements this week. Houa built a beautiful pair of curved, laminated teak rain‑gutter eyebrows, one to go over the entryway and the other over the galley window. Each has several improvements over the originals. 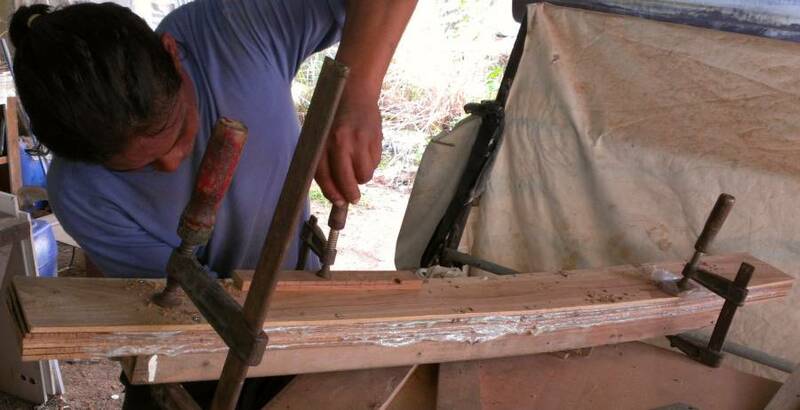 Houa also made 3 teak mounting blocks to replace the old plywood ones under our spinlocks and turning‑blocks. Pla and Baw repaired the last of the whale damage in the port engine room. Then they ground back and reinforced 5 of the 8 areas around the rudder‑tubes with 4 layers of fiberglass (with Jon doing the last 3 areas). The fiberglass still needs to be sanded and painted. Baw and Lek spent much of the week preparing the cockpit for gelcoat spray, scheduled for next Monday. This is a high priority so Houa can start laying down the teak flooring in the cockpit. Dui and Ben and Pla had the really grotty jobs - smoothing the old gelcoat in the fo'c's'les and the chain lockers, to prepare them for painting. Jon and Amanda spent much of the week drawing out exactly where we want the nonskid to go on the foredeck, and making up templates so Mike can cut the nonskid to the correct shapes. As part of that they found where a reefing pad‑eye has to go at the base of the mast, and ground back the filler so it could be mounted flat. 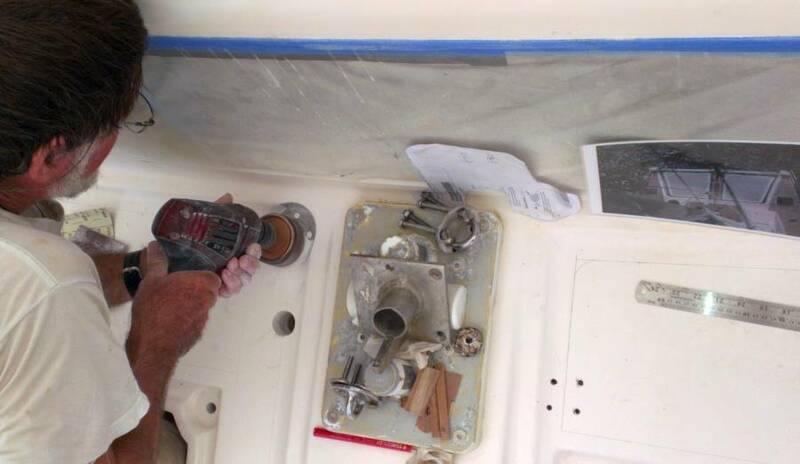 Jon de‑cored the anchor‑winch bolt‑holes, but they still need to be filled. Sue made good progress polishing spars and sorting and cleaning bits and pieces. With Amanda she took a complete inventory of the bits stored in our apartment. Team Hacking also worked out now many mast steps we want (27) and where they need to go. Got home late last night after a movie and dinner with friends way up north, so Monday morning came way too fast! Lek and Pla dedicated the day to the cockpit floor where the teak will go. They got more filler put down on the starboard‑most floor, and more epoxy coating rolled on. They also hand sanded and long‑boarded the rims of the floors. Late in the day Houa climbed up to check it all out. Apparently it is going well, but needs a couple more days. We didn't see Ben today, and Baw only arrived after lunch. But his arms are a mass of boils and welts. "Fiberglass" he said. But when we asked him later, he said "Epoxy." Our guess is that he has been "epoxified", meaning he has developed an intolerance for epoxy, which is not uncommon. 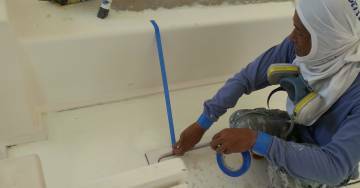 This heralds the end of big epoxy jobs for him. Luckily for Baw (and Ocelot) we're almost at the end of the epoxy work! We wish him a speedy recovery, and when he's back at work (tomorrow, he says) we will be sure he doesn't do epoxy work! 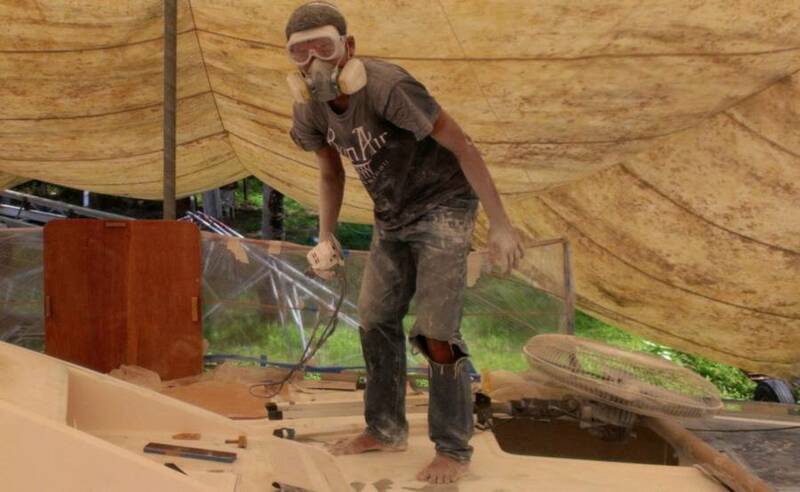 Houa had an easy day as he waits for the cockpit trim and floor to be ready for his beautiful teak planks. We asked him to make up new solid teak bases for our cabin top Spinlocks (line clutches) and turning‑blocks for the mainsheet and vang. 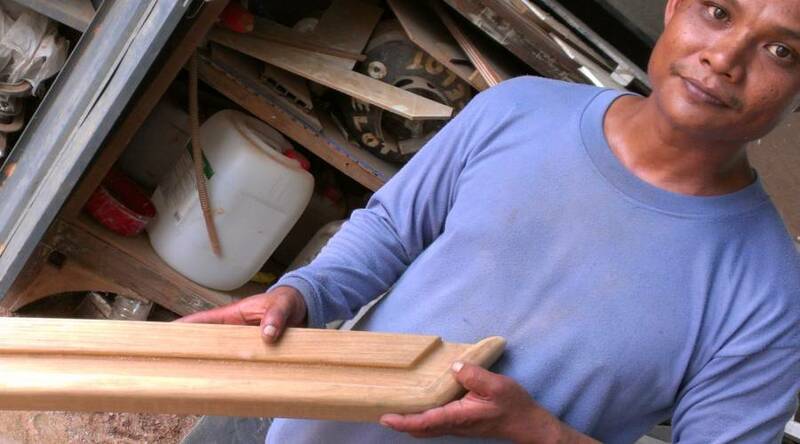 All of these bases were made 18 years ago out of plywood! Can't believe it. Of course, they are sort of eroded away between layers of wood and look horrid. Houa's new ones should look very spiffy under the hardware! We also had to interrupt Houa from the teak project to cut up more thin plywood strips so Jon and Amanda could continue making templates. Sue attacked multiple items today, but it basically boiled down to hardware sorting and cleaning. The old Spinlocks we took off the plywood bases are badly corroded underneath and we can't figure out why they were engineered the way they were -- salt water can enter and sit for weeks if not rinsed with massive fresh water. If you seal the units tightly to the deck it only makes the pooling worse, as there are slots for the water to enter, but nowhere for it to exit. Jon may do a bit of after‑market engineering to allow water to drain out and protect them from further corrosion. Building templates - Super-glue is wonderful stuff! Sue also pulled the 14 teak and metal mast steps out of storage, and at first glance we all thought they are bronze or copper or something as the metal has a greenish bloom. Houa said they are stainless, and that's what it looks like when it hasn't been cleaned or polished in a long time. Is 10 years a long time? Guess so. We certainly didn't climb the mast with the intention of polishing the steps! 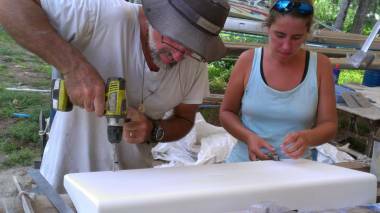 Amanda and Jon made more good progress on the nonskid templates for the cabin‑top. They finished the 3 they still had to do on the outside of the cabin‑top as well as 2 more just in front of our forward ports, and drew lines for several more areas in front of the salon. Five new templates in Mike's pile for today. Two almost newsworthy events: 1) Our boatyard kitty, Turtle, has decided that Ocelot is a great place to hang out, even in the middle of the day with all the activity. We must have encouraged her off the boat 6 times today, only to find her up at the top of the ladder once again. Definitely a ladder‑climbing kitty. And 2) Sue terrorized the neighborhood by driving a motor scooter for the first time. We had to return the rental from Sunday's outing, so Sue drove it (it's an automatic) back to near our apartment, with Amanda riding "shotgun" behind. All arrived safely, if not a bit jittery! Next step, Sue on our manual. Watch out, Phuket! Part of the strangeness of the day was we had workers shifted around on us again, so we had to think fast. E‑U came by to tell us we would not have Dui today, but could we use Yoong? For sure. Yoong is one of our favorite hard workers. But he is way too valuable to put into the starboard fo'c's'le where Dui was sanding the walls. So Baw was happy to have Yoong and Lek with him in the cockpit, and that freed up Pla to be the fiberglass guy. Jon got Pla started on what we hope are the last repairs of the whale damage in the port engine room. When the whale hit us (Mozambique Channel, 2007) outside the port engine room we found cracked glass and damage to the rudder and prop. But we hadn't noticed the small cracks in the gelcoat and fiberglass under the floor of the engine room. Obviously, they have caused us no worries in 6 years, but now seemed like a good time to attend to them. 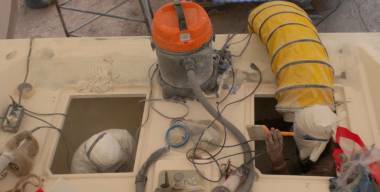 So Pla donned a white protective Tyvek suit, sealed off the engine itself, lowered the extractor fan and got to work. He ground back a big circle around the 2 bits of cracked glass, then he cleaned and vacuumed the whole area before glassing. Baw actually donned latex gloves and climbed down to do the actual glassing, as he understands just how we like to do several layers of increasing size of glass. Since Amanda was off at the dentist for the morning (last cheap dentist visit for a while) Sue worked with Jon up on the deck. 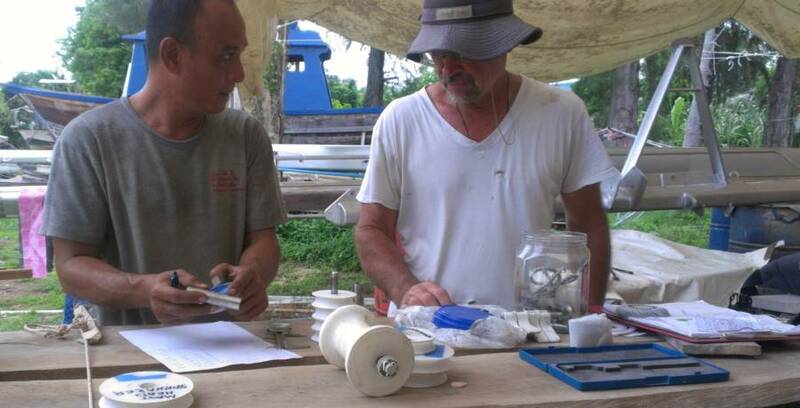 They looked first at the area around the foredeck and anchor windlass to figure out just where to put nonskid. Originally, we'd made a paper template of the shadow of the windlass, but Jon made a template of the footprint of the windlass, which is somewhat different. What we realized was that the (separate) chain stripper base‑plate was actually partially under the windlass! Not so good, as it meant that the windlass would be cocked over and not completely flat. Now we have to either cut back the ¼" (6mm) stainless steel plate of the chain stripper base, or dig the plate a hole in the deck. In the process of deciding what to do, we realized that since no other holes on Ocelot had been de‑cored by the factory, the anchor winch holes probably weren't de‑cored either - which proved to be correct. 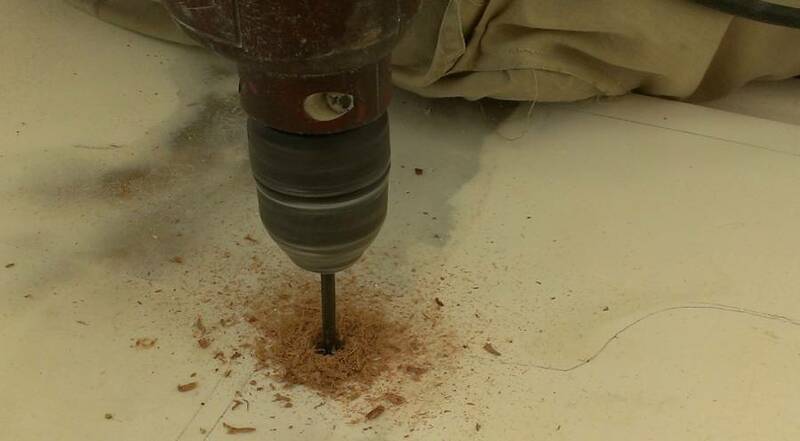 So Jon got out his handy dandy Allen key, inserted it into the chuck of the drill and spun/drilled out the balsa from between the fiberglass layers of the deck so that we can fill the area around the bolt holes with epoxy. This will prevent water from getting into the coring. The harder job was to dig the silicone out from around the bundle of electrical cables for the windlass, and try to de‑core the rim of that hole. From the smell of the balsa, we know that water has gotten in there before, but it was actually in pretty good shape. Jon and Amanda sealed the bottoms of the bolt holes and the hole for the chain with duct tape in anticipation of syringing in epoxy tomorrow. Ben spent the day in the dungeon of dust again. He may or may not be finished sanding the port fo'c's'le, but he moved to starboard and thereby gained some relief from boredom. These are big areas to sand, and it's not nice down there. As the youngest of our workers we're impressed with his fortitude and unflinching willingness to do the grunt work. 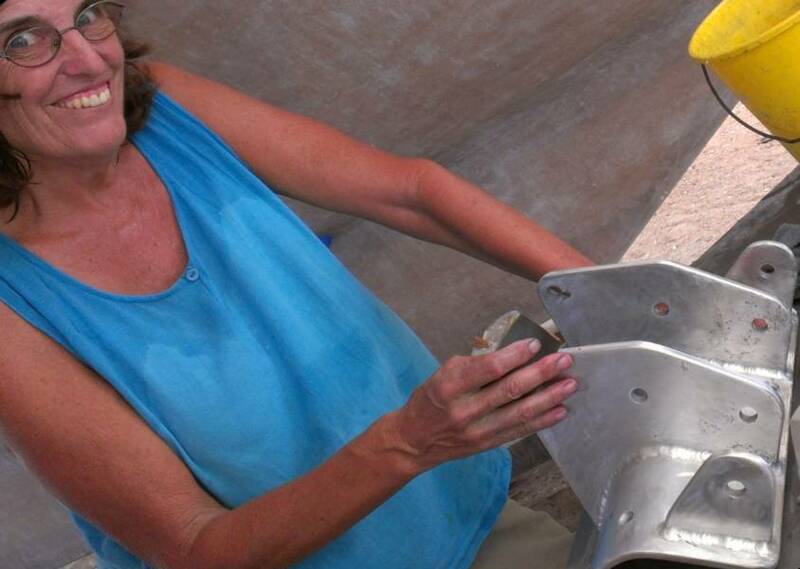 Sue got in a couple hours of aluminum grinding on the forebeam in the afternoon. The Nyalic she applied on Sunday is looking great, but she had purposely left some areas untouched, because they needed more polishing. So today she did the tangs and the ends of the forebeam, getting them ready for wet sanding with 400 grit. Houa finished the 3 new teak bases for the Spinlock line clutches and the deck blocks. His next project is the "eyebrows" over the companionway and the galley window. These are 4' (1.2m) long pieces of teak that act as gutters to keep rainwater from getting into the entryway or the galley window from the cabin top. But neither is as long as it should be. The eyebrow over the companionway is factory ‑made and nicely curved downward, parallel to the cabin‑top, but Jon made the eyebrow over the galley window back in the Caribbean, so it's just straight. So Houa used that old curved teak as a template for the new pieces. He planed a bunch of planks down to about 2/3" (8mm) and then used epoxy glue to stick them together as he bent them over the old curved wood. To keep them from slipping sideways he screwed them together on the outer (sacrificial) edges. Then he clamped the whole pile down tight. Tomorrow morning we should have a rough bent laminate all ready to cut and shape. Then he gets to do it all over again for the second eyebrow. Half way through the week and things are moving, but we're just short of feeling like a run‑away train again with maybe too many workers. We had both Ben and Dui in the fo'c's'les today so there was lots of sanding and clunking noise from the bows. Both men emerged occasionally to drink some water or for lunch, looking like white ghosts from all the dust. Late in the afternoon Baw suggested they use the power sanders (grinders with sand paper disks) instead of the dancing (orbital) sanders. He said, "Dancing sander no good. Power sand very fast. One day!" Great, now he tells us, 4 days into it! When we installed our new rudder bearings back in February, we had to cut away a fair amount of fiberglass from inside the bottom of the rudder‑tube. 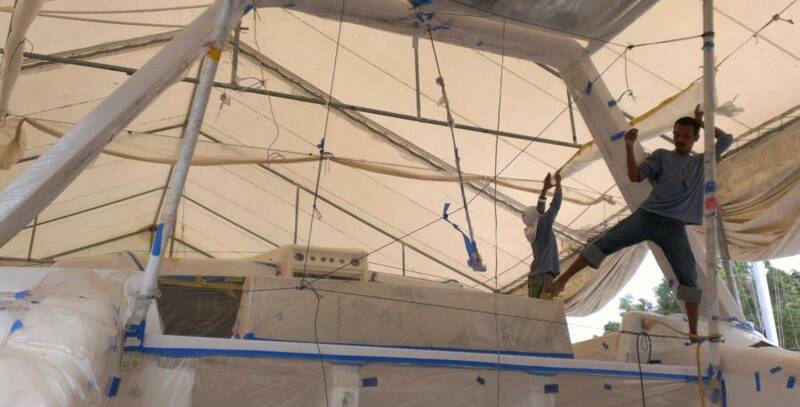 Now we want to put that supporting fiberglass back, but on the outside of the rudder‑tubes. But first the old gelcoat had to come off so we have a good surface to bond to. The rudder‑tubes are just aft of the engine rooms, so Pla spent the morning and much of the afternoon deep in the port engine room grinding/sanding back the gelcoat from around the bottom of the rudder tube. 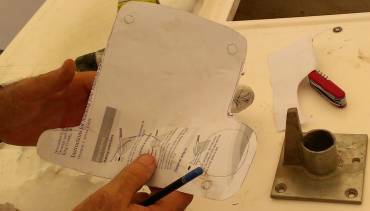 Tomorrow Baw will epoxy in several strips of biaxial glass around the base of the rudder‑tube, down where the new bearing is. Amanda created a couple more templates in the morning but unfortunately, since she forgot to show them to Jon, he went ahead and made the same ones himself while she was out running errands with Sue. Ooops. Oh well. At least they weren't big and complicated. The pile of finished templates is growing. Mike from AME is due to come by tomorrow so we'll be passing these latest ones along to him so he can cut the nonskid. 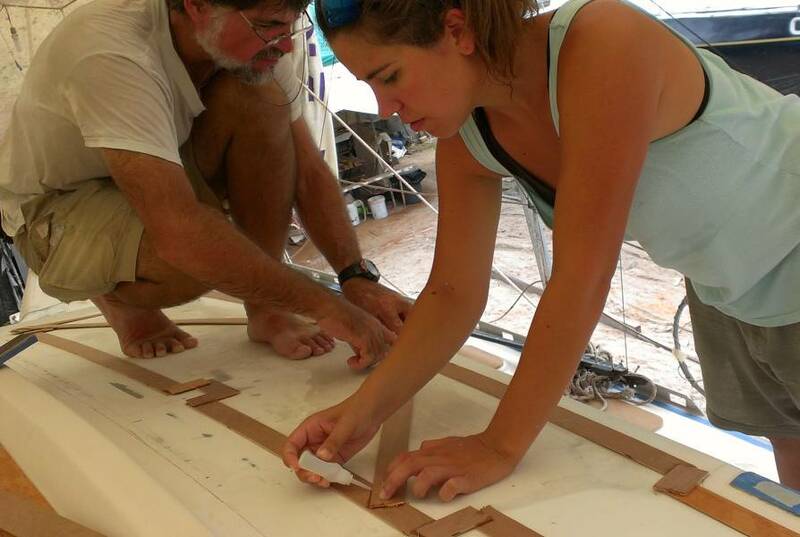 Jon and Amanda spent time on the foredeck figuring out where the reefing line pad‑eye goes. It took finding an old photograph of the bow area to see where it was placed, as the holes had been covered with filler and gelcoat. Jon used a fancy home made sanding wheel to grind down the beveled gelcoat near the mast to create a flat space for the pad‑eye to go. Houa un‑clamped yesterday's laminate masterpiece and planed it down to the right width. Then he took it up on deck to try it out over the companionway. It's going to be gorgeous! He also got the second "eyebrow" laminate epoxied together. This one is made with 1/4" (6mm) thick teak strips which he tacked onto the curved template (the old eyebrow itself), then glued on subsequent layers. 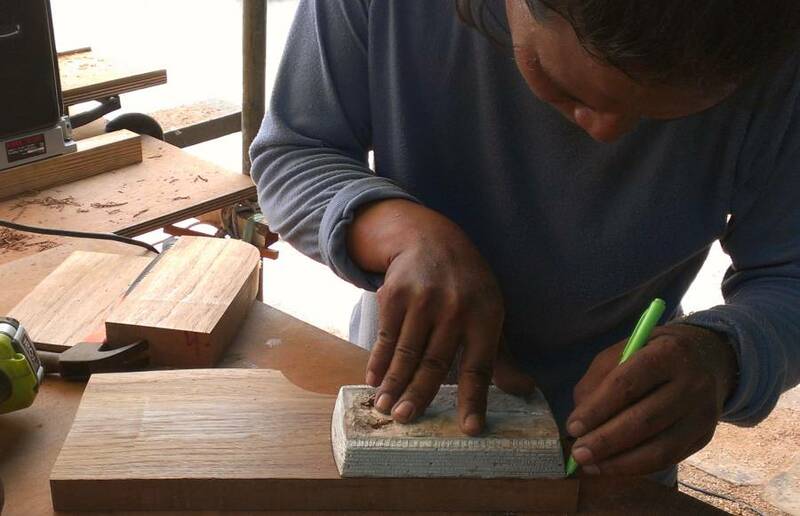 It's really fun to see a real craftsman at work. Lek and Ben sanded the big port seat of the cockpit to get it ready for filler. This is the last deck place to be filled from when the balsa was removed and foam added. Too much weight had been put on the foam when it was glassed over, so a big rectangle was depressed. Annoying, but nothing some polyester filler can't fix. It will all be covered in gelcoat soon. Yoong and Baw cleaned and sanded and then covered the entire cockpit so that it is ready for Mike's gelcoat spraying. We're still not sure when that is, but we hope very soon, as nothing stays clean around the yard, not even decks covered in plastic! Yoong also got the entire aft lockers sanded and clean (again), and covered as well. Sue worked on sanding more aluminum. Then grinding, polishing, and sanding again. She was working on the bracket for the anchor chain beam, and it is a bunch of hard to get to areas. The main problem is being able to see the deep scratches. They show up in some light and not in others. Or maybe this is all due to ancient eyes. Amanda had no trouble helping out and getting right to the scratches with the power sander. A noisy, fiberglassy, dusty day on Ocelot, with 7 workers and 6 projects going. Plus Team Hacking, of course! Jon and Sue arrived to find Pla already in the starboard engine room, grinding/sanding back the gelcoat around the rudder tube in anticipation of getting its reinforcing fiberglass. It was a messy, hot, dusty job, but Pla is an uncomplaining worker. 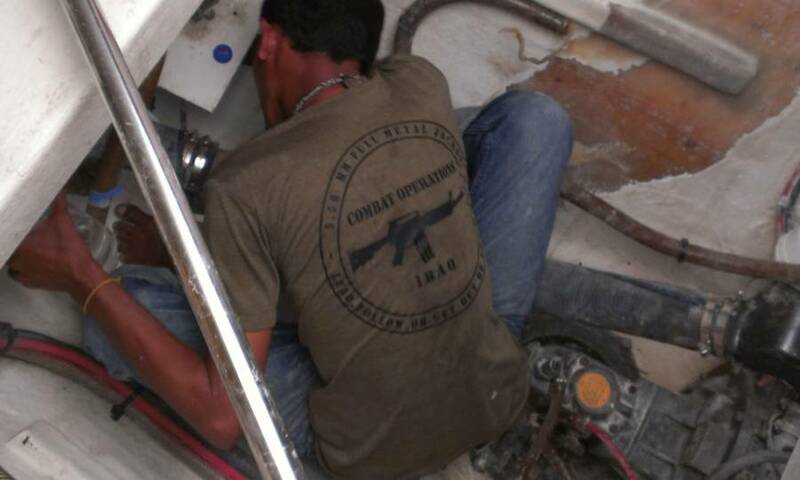 Once he was finished grinding, he washed the deep engine room bilge with water, then siphoned it out. 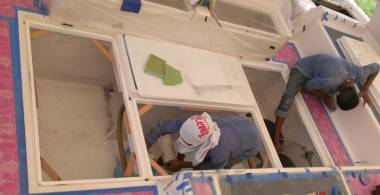 After lunch he worked with Yoong to fiberglass 2 of the needed 4 areas around the tube. Lek was the man on filler duty today, getting the final, smooth layer on the port cockpit seat. At least we hope it's the final layer. Time to call it "good enough" and cover it in plastic until it gets its nonskid and gelcoat. 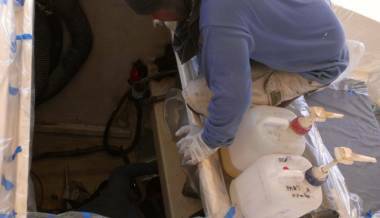 Baw worked down in the port engine room, putting the fiberglass strips around the rudder‑tube that Pla prepared yesterday. He got 3 of the 4 cross‑sections done. Jon will have to grind the 4th, hard‑to‑get‑to area himself tomorrow. Unfortunately, he may also have to glass it himself, as Baw left early again with a bad case of skin blisters. He may have to avoid all epoxy work in the future. The biggest noise and mess today came from the 2 fo'c's'les where Ben (in port) and Dui (in starboard) continued sanding the walls, ceilings and bilges, smoothing out the gelcoat and fiberglass. They both spewed volumes of dust into the air, and the gentle breeze blew it forward from there. Unfortunately, that was right into Houa's workshop. Team Hacking spent most of the day off the boat, away from the dust. Sue got some of the pins pulled from the old rod rigging and ran "find it" errands to the storage unit. It is so nice having all the boat bits and pieces and parts just a 2 minute walk away! Sue also had a long discussion with Top, owner of the local chandlery, about different International paints for our hulls. We'll put many layers of epoxy resin under the waterline as a barrier coat to protect our polyester hulls, but the epoxy will break down in the UV before we launch so it needs to be covered, and it's too early to put the antifouling on. Apparently both Interseal 670 and Interprotect are appropriate opaque primers to go under the antifouling. We hope to be able to apply each coat soon enough in sequence that we can avoid sanding between coats. Apparently the new International bottom paints can be in the air for many months before getting a final, top coat a few days before launching. Jon and Amanda gave a lot of thought and discussion to the mast and boom sheave issues. One problem is that we seem to be missing 8 boom sheaves. Where did they go? Late in the day they attacked more nonskid templates, working on the detached hatch covers for the aft cockpit seats. This involved drilling and mounting the hinges to be sure we had the position correct. Amanda calculated that we'll need a total of 81(!) pieces of nonskid. So far we've made almost 40 templates, but we clearly still have a long way to go. Mike and Wiwat from AME both came by to discuss the upcoming tang project on the mast. Mike also checked out the cockpit area that needs to be gelcoated next. It will be tricky to get all of the small hatch rims done in one go, but he will try. Once he's done the gelcoating around where all the teak is to go, Houa can begin laying the teak! We tentatively have a gelcoat spray scheduled for next Monday. Mike also took away another handful of nonskid templates, but the bigger ones need the company truck. Houa (once again) made the most visible progress, playing with the rain gutter "eyebrow" over the companionway. He routered out a rain‑channel and added the handrail front piece and the beveled end piece. He will be shaping and sanding the front edge to make it comfortable to grab as we go in the entryway. The whole thing will be similar to our old one (which we loved) but with small Houa‑esque improvements here and there. A bit of a split‑up day, as Sue and Amanda took advantage of the dusty atmosphere on Ocelot to spend the morning taking inventory of all the boat stuff that's in Sue and Jon's apartment. Found some "long lost" items, and things we had forgotten we had! Jon meanwhile, held the fort on the boat. Both Ben and Dui moved from fo'c's'le sanding to attack the foredeck anchor and chain lockers. These lockers are badly stained from rusted chains, but sanding them should be a much shorter process, as these spaces are way smaller than the fo'c's'les. 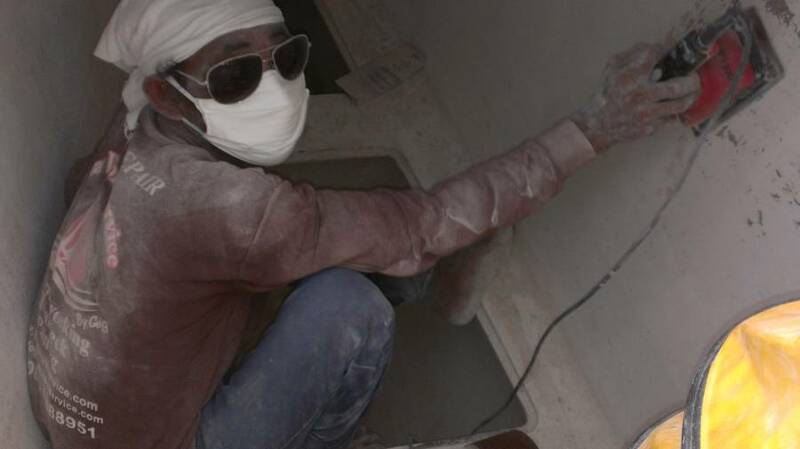 They still ran the extractor fans but ended up covered in white dust anyway. Jon also got white today. The rudder‑tubes (what the rudder shafts run inside of) are bonded to the hull and to 4 plywood stiffeners that form a + when looked down on from above. Since we lost some material from the insides of the tubes when we installed our new bearings, we want to add that strength back by adding more fiberglass to the outside of the tube, especially down at the bottom, where the new bearing is. 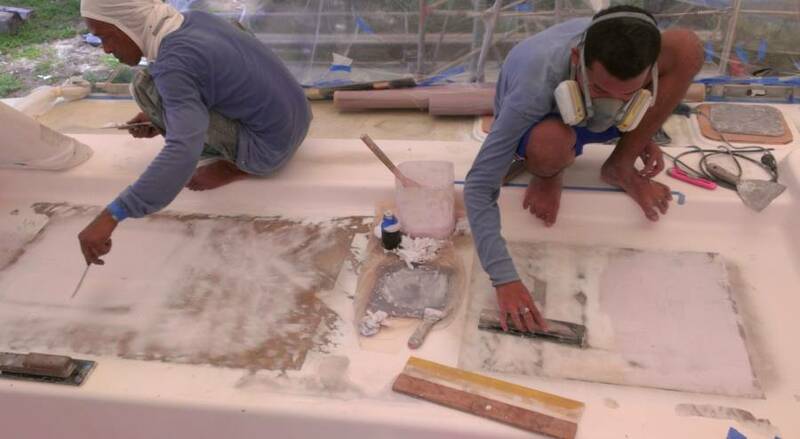 So we asked the guys to prepare those 8 quadrants (4 for each rudder‑tube) for more glass by grinding off the gelcoat in the area, so the new fiberglass could bond to the old glass. 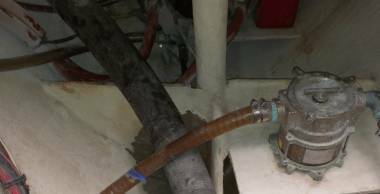 But our water‑heater tanks are just aft of the rudder‑tubes, and the pipes going into and out of the tanks make 3 of the 8 quadrants difficult to get a grinder into. When Pla mentioned this on Wednesday, we told him (through Baw) to just do the best job he could, and it wouldn't matter if it wasn't perfect. Somehow, those instructions got translated to "don't bother with those quadrants" which meant that Baw only glassed 5 of the 8 quadrants yesterday. So today Jon donned the white Tyvek "Bunny Suit" and ground back the gelcoat around the 3 tricky parts of the rudder‑tubes, working in very cramped conditions just aft of both the port and starboard engine rooms. He emerged absolutely dripping, turned the bunny suit inside out, and hung it up to dry. 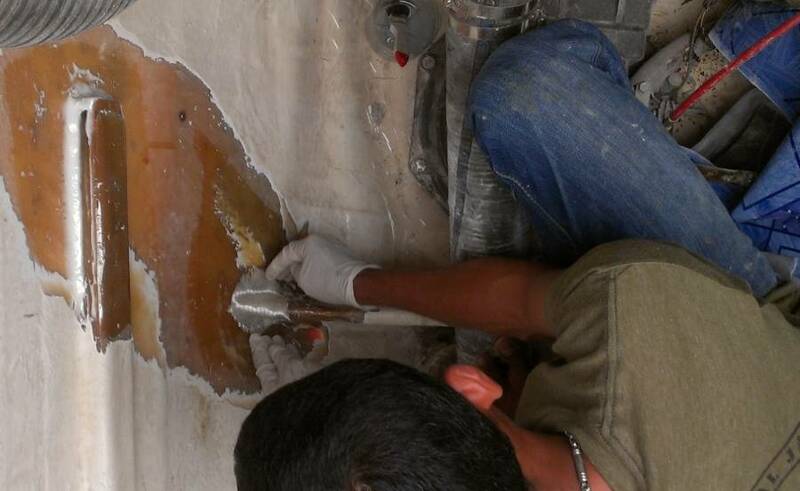 After lunch Jon climbed back into the engine rooms with fiberglass pieces (cut by Baw) to epoxy them into place. Amanda was his on‑deck back up with Lek mixing the epoxy, as we refused to let Baw get anywhere near the epoxy so soon after his allergic reaction. 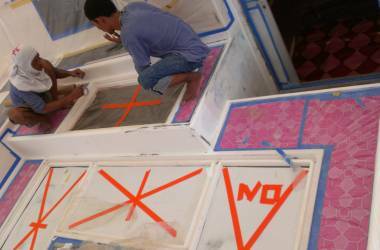 Jon got 3 layers of structural biaxial glass and one layer of finer cosmetic glass on each of the final 3 areas, so now we only have to sand and paint those areas, which should be relatively easy. While Jon was playing with epoxy and mud and glass, Baw and Lek continued their clean‑up and masking of the cockpit for Mike's (potential) gelcoat spray on Monday. Fingers crossed! Everything is so nice and white and clean, we are anxious to get this gelcoating done! Amanda was the heroine of the day when she located the missing sheaves and pins and hardware for the boom. It wasn't really lost, says Sue. Just labeled strangely. Well, when you have a plastic container with about 10 different pieces of hardware, "Boom Bits" sort of covers it all. But our search on the "LIST" document for sheaves, pins, etc turned up nothing. Amanda found them with the search criteria of "boom". Smart girl! Once the pieces were located, Sue spent the afternoon with the degreaser, sandpaper, pick, scraper and fingernails getting the old silicone, grease, and dirt off. Can't wait to reassemble things now! 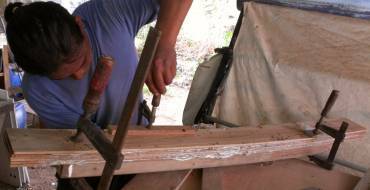 Houa continued his work on the eyebrow pieces to go over the companionway and the galley window. He got the front wide grab rails glued on, and all clamped up. His other small teak project is to refurbish the small teak step that leads from the companionway up to the helm area, for which we bought him a new router bit to make lovely smooth rounded grooves. A strange sort of slowed down day. Must be the TGIS syndrome. But at least it was cooler with a strong breeze from the southeast. Houa finished the 2 eyebrows that go over the galley and the companionway today. He gave each a nicely routered channel on the bottom, so that when rainwater runs down the aft side it doesn't run under the wood, hit the wall, and drip into the window or salon. This was actually Jon's idea, which he'd implemented when he built the (straight, clunky) original eyebrow over the galley window when we were in the Caribbean. The little groove under the eyebrow makes that drip of water fall off (or run uphill to get to the wall). Houa also rounded all the aft edges so we have lovely surfaces for holding onto when descending into the entryway or (in the case of the galley eyebrow) a nice smooth place to rest our feet when sitting at the helm! Pla, Ben and Dui were all up forward once again. Ben and Dui were grinding and sanding in the chain and anchor lockers, and Pla was cleaning and washing fo'c's'les. By day's end the guys were out of their bunny suits and cleaning things up. Jon bought 4 liters of International 670 Primer (a 2 part epoxy) which we hope to apply by roller, on Monday. Good thing we checked in the fo'c's'les before we went home, as there was still water from the wash‑down in the bottoms of the 4 forward bilges. Don't think it would have all evaporated by Monday, given how humid it is right now! Jon and Amanda got another template made, the one they drew out yesterday for the aft‑most cockpit seats. There was some nice symmetry there, so only one template had to be made. They spent a lot of time discussing future projects, and especially the placement of the mast steps. We have had a combination of folding metal, folding plastic, and rigid bent metal steps with an enclosed teak foot pad. On closer examination of the rigid metal steps, they are made of plated bronze, and have caused lots of corrosion on the aluminum mast. We sent a sample one off with Mike/AME to get a quote on making us new ones out of bent aluminum so that they'll be compatible with the mast. We'll keep the teak pads, and get Houa to make more as needed. The rigid steps are safer by far, in that your foot can't slip sideways off the step and there's more to hold onto, but they're significantly more windage and halyards tend to get stuck behind them if you're not careful. If we can get them in aluminum, the improved safety would be worth it. And then if we space them a bit closer, Sue might even climb the mast some day! The local machine shop came back with a quote to remake many of the sheaves for our mast and boom. This shop isn't very sophisticated, but what they can do they do well. They're cheaper than many of the more sophisticated machine shops, and the sheaves don't need sophistication. Their quote was about the same as AME's quote, but instead of remaking the sheaves exactly as they were, they're going to improve them by adding oil‑light bronze bushings to the centers of the sheaves. This should allow the sheaves to last much longer. Sue cleaned up more boom and mast bits of hardware, and tried out the imported German stainless steel polish (Wenol) on a bit of stainless that surrounds the teak step to the helm. Looks gorgeous. Given that tomorrow is Mother's Day (well, in our "other" hemisphere) Sue did not prepare for a day of Nyalic. Sunday beckons with a Mother's Day brunch, then afternoon coffee with cruising friends!